Our benchmark results suggest that the ARRA created/saved approximately 450 thousand state and local government jobs and destroyed/forestalled roughly one million private sector jobs. 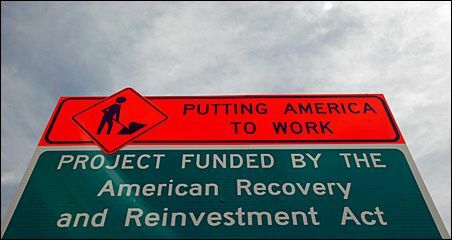 State and local government jobs were saved because ARRA funds were largely used to offset state revenue shortfalls and Medicaid increases rather than boost private sector employment. The majority of destroyed/forestalled jobs were in growth industries including health, education, professional and business services. This suggests the possibility that, in absence of the ARRA, many government workers (on average relatively well-educated) would have found private-sector employment had their jobs not been saved. Searching across alternative model speciﬁcations, the best-case scenario for an effectual ARRA has the Act creating/saving a net 659 thousand jobs, mainly in government. A large fraction of the Federal ARRA dollars was channeled through and controlled by state and local governments. . . . Upon acquisition of ARRA funds for a speciﬁc purpose, a state or local government could cut its own expenditure on that purpose. As a result, these governments could treat the ARRA dollars as general revenue, i.e. the dollars were effectively fungible. . . . Federal aid arrived when state and local governments were entering into budget crises. . . . The deterioration of the non-Federal government budget position occurred concurrently with an increase in Federal grants . . , mainly due to the ARRA, of approximately the same amount. In fact, a substantial component of the ARRA was authorized speciﬁcally to cover states’ tax losses (through the State Fiscal Stabilization Fund) and the most dramatic cost increases (through support for state Medicaid programs). These federal policies were inspired by the similarly harmful policies of FDR in his New Deal of the 1930s. However in his book, Depression, War, and Cold War: Challenging the Myths of Conflict and Prosperity, Independent Institute Senior Fellow Robert Higgs has shown that federal stimulus measures then were responsible for prolonging and deepening the Great Depression which did not end until after such policies were ended in the immediate aftermath of World War II.